When making Mexican recipes for dinner, snack or appetizer don't forget this wonderful guacamole dip recipe. Jan made this tasty dip for a party. The added bacon crumbles adds such a great flavor. In a medium size bowl, mash avocado. Add the remaining ingredients and stir until well mixed. Put pit in center and cover. Refrigerator for an hour before serving for flavors to blend. Serve with corn chips, spoon on a bed of lettuce, or use for dipping quesadillas into. 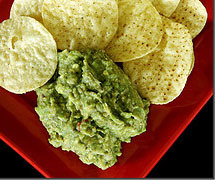 Suggestion: To keep the Guacamole Dip the nice green color, store the dip with the avocado pit stuck in center and cover tightly. The acid from the lemon will also help it to keep a nice green color. Some Avocado facts: There are many varieties of avocados. Most common and my preferred is the Haas avocado. Found year round in most supermarkets. When selecting an avocado feel if uniformly hard or soft with an unblemished surface. If it is hard, that means it needs to ripen a few days. Ripe fruit bruises easily in the stores and in transport. I feel it is best to ripen your own at home, using a brown paper bag. At room temperature 2 to 5 days away from direct sun. Once ripe, your avocados can be stored in the produce drawer of your refrigerator for 1 to 2 weeks. Whats your favorite Guacamole recipe?